I bought this jigsaw about 3 months ago. The model is no longer available new, but after visiting 5 stores I was able to find this older model on display. I wanted the 1590evsk, because there have been so many reviews done on this model I knew it would meet my needs. As you see in the picture I bought a couple blades to go with the saw. This guy on e=bay puts up 89 blades a week on e=bay auction and I bought all these blades for 65 bucks. I even got a blade for cutting leather and rubber. I used the saw to cut a few of my patterns for my outdoor chairs, I have played with it a little, but have not done any serious work with it yet. In the future I plan on using the saw for some pattern making, and with some experimentation I’ve found that you can make a helluva plunge cut Thur solid stock for circle cutting and the like. I bought the big variety of blades so I would have the ability to cut plastic, steel, and other materials when the rare occasion arises. I have plunged Thur solid 5/4 hard maple, cut a fairly strait line Thur 1/4 steel plate, and have scrolled some nice looking curves. This saw is great for the odd jobs that you’ll run into in the shop. The blade guide cuts true and strait Thur thick hard wood, dust blower OK, blade change with the quick release is quick. I would also say this is the perfect alternative for the new wood worker who can’t afford a band saw. I LOVE those Progressive blades! They cut SO SMOOTH! I got a Bosch 1590EVSK a few years ago… and LOVE it! I love my bosch jig saw. Most of the other brands try to copy bosch so why get anything else. Definitely an alternative for a scroll saw but doesn’t quite match the capabilities of a band saw in my opinion. Still, cant go wrong with a bosch jigger and well worth the money. David, back in the 1970’s there was a guy named Red Hillberg, who had done all the carpentry work in my parents home. He worked all the trades from the start of the new deal until he passed away in the early 90”s. The one thing I remember about Red, was how much he used the scroll saw from cement forms, to fencing, and the scroll work for my mom’s kitchen cabinets. This guy drew lines freehand, then cut exactly, and effortlessly. The cabinets he made for my mom in the late 60’s are still there today. Red, was the type of guy that I think you’d have enjoyed working with. Years later when I started my wood shop in the mid 2000’s, I thought of Red, and his great scroll work. I went to Sears, bought a scroll saw that was the same shape as the one Red, had and discovered that the saw was a piece of #@^&, or I had no talent. I dreaded working with the tool, and in the past 6 years have only used it a few times. It wouldn’t surprise me if Red, had owned a Bosch way back then. I love that saw. One of the best tool purchases I have made. Cheap scroll saws have given this type of tool a bad name. I bought one for my Son in Law as one of his first tools. It is such a handy tool to have. Can’t say enough about it. I’ve got 2 Bosch scroll saws. I had to buy a second one when I needed it and the first one had gone hiding. I knew it would show up as soon as the new one came into the shop. I found it hold up something else off the floor. I’m glad to have them both back. About 5 years ago a guy on ebay was selling about 100 blades in a bulk pack. I bought 4 different styles. So I’ll never run out. Well, I’ve got to say that I have not used a hand held sabre saw more that a couple of times over the last lots of years. Always found them to be lacking in accuracy…oh wait, one of my favorite phrases is, “accuracy is not in the power tool, it’s in the woodworker”...yikes, I guess I have to point that finger back at me…I guess I mean that I’ve never gotten a very satisfactory result. 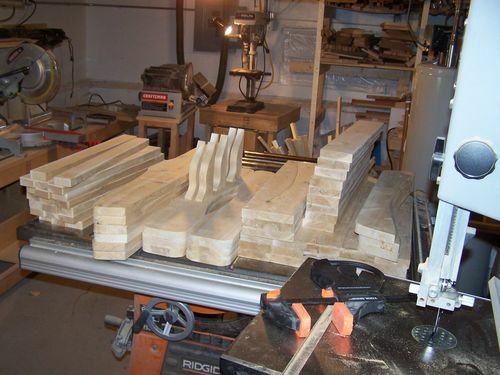 None of those saws was very expensive & I used them for rough cutting or quickie stuff. I never used them for “real” woodworking projects. That’s what my bandsaw & Shopsmith jigsaw were for, the real stuff. Because the results were good. Your review has caused me to (perhaps) reconsider that approach. Maybe I haven’t been entirely fair in my choice of uses & subsequent assessment of a handheld. Steve, I read your review several times before buying thanks!!!! Karson, with the size of your shop it doesn’t surprise me that things disappear and reappear on occasion. I have had that happen with other things but never my beloved tools!!!! Nice review Bob. I will take my place in line as I too am a Bosch jigsaw fan. I own the barrel-grip version but as you and others have stated, you can’t beat Bosch when it comes to jigsaws. I love that Shopsmithtom referred to it as a sabre saw. I haven’t heard that term in some time. You’d have to pry my 1590 out of my cold, dead hands. Great jigsaw, too bad they replaced with something not as good. the only jigsaw that can hold a candle to a Bosch is a Metabo. I happen to have one, made in Germany. this is definitely a tool worth finding used. I made a Blank for my router table… drilled a hole for the blade… mounted the Bosch jig saw to it… plopped it into the router table… and tried it! If I did not go very fast, it worked fairly well… BUT, if I really wanted to cut things a little faster, the board would start going up & down… forcing me to go slower! What I need to do now is mount a couple of clamps to clamp it to the router table underside… Then, it should work fine! I also had to turn the switch ON (unplugged) & made it so it stayed ON… then, I plugged it into the router switch… and turned it on/off just like it was a router! I found it was much easier to SEE the blade & WHERE it was cutting. Great review, Bosch makes some good jigsaws! I had been using an old B&D saw for years because I owned it and it was all I had. My son and I went to a wood working show a few months ago where I purchased the Bosch and that was the best purchased I ‘ve made in a long time. When I first started doing wood work, it was repairing and remodling old houses that my wife and I bought as we progressed through the years and a lot of the tools I owned were necessarily cheap. It was either do the work or spend the money on tools, the work won. After I retired I started upgrading my wood tools. I have a bosch router as well as the 1590 saw,well worth the price. I am a retired mechanic and I know the value of good hand tools. I didn’t know how much better and easier it was to cut properly until I used that new saw. Wouldn’t take for it . I might be really out of touch because I always thought of a jigsaw as a more or less stationary tool with the overhead arm connecting to the other end of the blade & a sabre saw was a hand held gizmo where the blade reciprocates. Did I, because I just don’t really use them & pay attention, just fall into some kind of time warp…having just now popped out on the other side to learn my terminology is out of date??? Man, I gotta pay better attention to stuff that doesn’t say “Shopsmith” on it, I guess.